Devils Tower, in northeastern Wyoming near the Black Hills of South Dakota, has been a location of spiritual significance for the Lakota people throughout their history. In June, particularly important ceremonies connected to the summer solstice—pipe ceremonies, sun dances and vision quests—are held near the tower. Lakota elder Johnson Holy Rock says: “If a man was starving, he was poor in spirit and in body, and he went into the Black Hills, the next spring he would come out, his life and body would be renewed. So, to our grandfathers, the Black Hills was the center of life, and those areas all around it were considered sacred, and were kept in the light of reverence.” More recently, however, people make a different sort of journey to Mato Tipila: the challenges of the tower’s sheer walls have attracted recreational climbers for almost 100 years. As depicted in In the Light of Reverence, some rock climbers believe that because Devils Tower is National Park Service land, it should be open to use any way they choose for their sport, and any time. For the Lakota, and other tribes of the northern plains, the solitude and silence they need for their ceremonies and prayers are disturbed by the presence of rock climbers seeking personal adventure. Meanwhile, some climbers argue that climbing is a spiritual act. The National Park Service has tried to find common ground by proposing a compromise, asking climbers not to climb during the month of June, when Indian ceremonies are at their height. In 1995, the first year the NPS requested that climbers stay away during June, 85 percent of climbers complied. This reflects the power of using public education at the grassroots level, rather than regulations and the force of law. However, several climbers in alliance with the conservative Mountain States Legal Foundation have sued the Park Service, claiming an inappropriate government entanglement with religion. (Ironically, it is a federal offense to climb Mount Rushmore, considered by many to be a bona-fide American “sacred site.”) Some climbers see the Tower as their own sacred site, and feel that banning climbing violates their religious freedom. 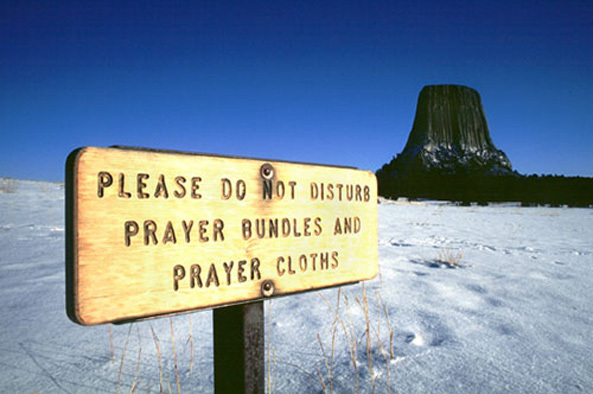 “We may be interfering with their prayers,” says Frank Sanders, “but it’s not fair for them to lock me out of my church altogether.” The Park Service and Devils Tower’s former Superintendent Deb Liggett maintain that they have a mandate from the American people to preserve cultural properties. A federal judge agreed. While most climbers continue to respect the June ban, the number of climbers started creeping up slightly in June 2000 and June 2001. The Park Service should maintain its “no climbing” public education program and vigorously defend the policy in court. The Park Service should emphasize that choosing not to climb Devils Tower at any time of the year is the most respectful course of action. Year-by-year comparison of the number of climbers at Devils Tower during June from 1994 through 2001.